The Nuclear Regulatory Commission dispatched a special group of federal agents from the Office of Investigations, to the Palisades nuclear power plant after reports of year-long leaks from the safety injection and refueling water tank. 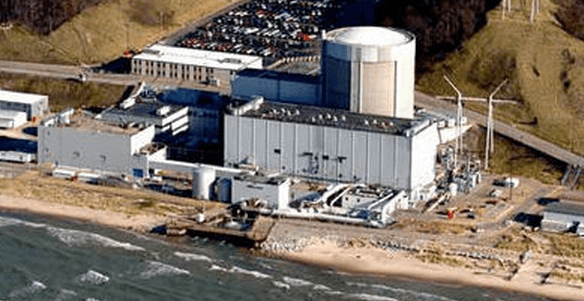 The Palisades nuclear power plant in Van Buren County had five unplanned shutdowns last year, one was considered to be of substantial safety significance. The plant remains off-line, after being shutdown on June 12th. The Office of Investigations began the probe into the water tank leaks specifically, according to Prema Chandrathil, public affairs officer for the NRC. Instead of being restricted to only looking for obvious performance deficiencies, these inspectors can look into possible wrong-doing which sometimes occur when companies handle unusual situations, and can make referrals to the Department of Justice. These federal agents have an average of 20 years of federal law enforcement service, having served at agencies such as the Federal Bureau of Investigation or U.S. Secret Service. These federal agents investigate alleged violations of the Atomic Energy Act, the Energy Reorganization Act, and rules, orders and license conditions issued by the NRC. The aluminum refueling tank holds up to 300,000 gallons of borated water, which also contains radioactive tritium. It has two purposes: to flood the reactor cavity during refueling outages; and to remove heat from the reactor core as needed, if there is a loss of coolant or a need to boost the safety margin during a shutdown. NRC inspectors on-site at the plant knew about the leaks since May 2011, workers monitored the leak until 31 gallons in one day leaked from the tank. The water flowed into catch basins under the tank designed to hold the fluid, a plant spokesman said. When the leaks hit that 31-gallon mark earlier this month, the plant was shut down so the tank could be repaired. Palisades has one of the worst safety ratings in the country, and that means the public and regulators are watching the plant more closely. Any unplanned shutdown would’ve not only been more costly, but possibly even more endangering to their operations, so the leaks were allowed to continue uninhibited for over a year, the leaking borated water was being collected in catch basins, and pumped back into the tank directly from the basins. Repair crews have made one repair to a weld on the seam of the base of the tank, and also analyzed the tanks nozzles, which are used to drain and fill the tank. Officials at the plant said they thought the leaks had been fixed earlier this week, but as they were refilling the tank at 4 am early Tuesday morning, they discovered that water was still leaking, leaving the restart date still unclear.